7" budget tablets have long been worth buying at $99, and today they may have gotten some company. E-Fun has just announced their latest budget tablet, the Nextbook Premium 8HD, and if it lives up to E-Fun's past reputation for decent but unexceptional hardware then this baby could be a keeper. TBH, I do not know whether that will happen. 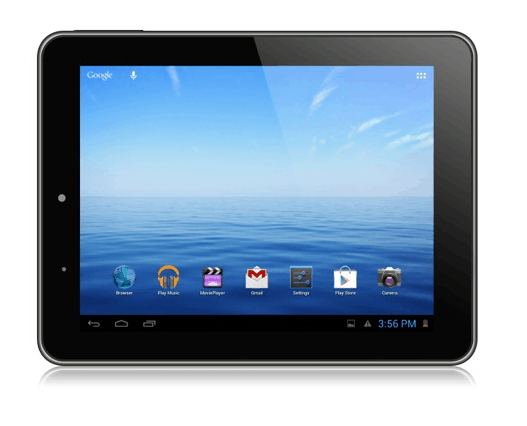 This tablet is running Android 4.1 on a dual-core 1.5GHz CPU with 1GB of RAM, Wifi, HDMI out, and a pair of cameras - a front-facing VGA camera and a rear-facing 2MP camera. This tablet ships with 8GB of Flash storage and a microSD card slot. The screen measures 8", and has a decent but not extraordinary screen resolution of 1024x768. That is a fairly common screen resolution for 8" Android tablets these days, and you'll even find the occasional Windows 8 tablet sporting a screen with those specs. The Nextbook Premium 8HD will ship with Google play as well as a full suite of Google apps. It's also going to ship with the Nook for Android app. Rather than develop their own ebookstore, E-Fun has always partnered with one ebookstore or another. Their first partner was Borders, and then after that company imploded in 2011 E-Fun worked with Kobo and now B&N Nook Media. E-Fun has been shipping the Nook for Android app on their tablets for past least the past 7 months or so, and I would expect them to continue (unless Kobo outbids B&N for the privilege). At first glance this looks like a decent tablet, with a screen, cameras, and CPU that would go on a tablet that cost $50 more. But as I drilled down into the specs I noticed that the battery life was rather limited. This tablet is specced as having a battery life of 5 hours, and that is rather limited. Given that the actual battery life is probably shorter I'm not sure this tablet is worth buying. But if you do want to get it you can find it at Walmart for $99. It is never enough to speak soley of screen resolution when talking about the display. Unfortunately, based on the info released by the manufacturer, that is often all you get.